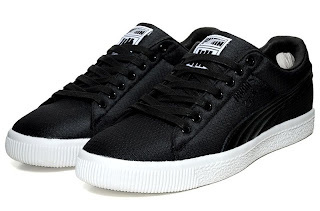 Puma team up with LA's Undefeated once again to rework one of the most recognised trainers of all time, the Puma Clyde. Originally the signature shoe of Walt "Clyde" Frazier, basketball's first true superstar, Undefeated opt for premium Ripstop to replace the original suede uppers while four new colourways accentuate the detailing of this classic style. Limited release.